Kashmir situation has been on the boil in recent months. 13 militants, four protesters and three army personnel have died in a recent operation in Kashmir. Media reports suggest that there is widespread anger and protests against these ‘killings’ of militants. But the same militants have been unleashing violence on civilians. Manzoor Ahmed Bhat, a man who was abducted by LeT (Lashkar-e-Taiba) militants has been found beheaded in Hajin (Bandipora district). Bhat’s body was found a day after his abduction. 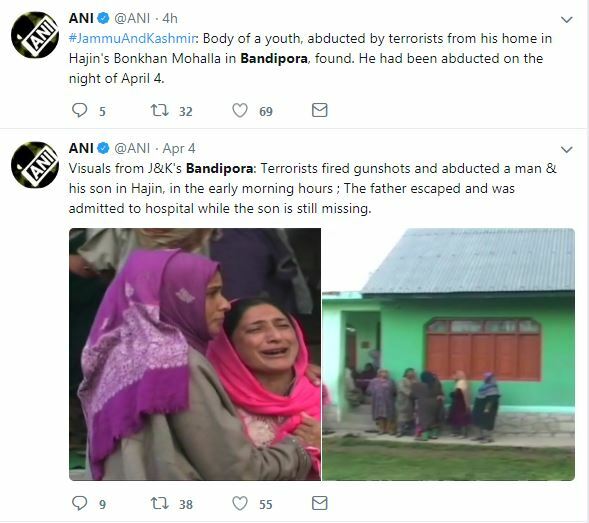 “The body of Manzoor Ahmed Bhat, who was abducted by Lashkar-e-Taiba (LeT) terrorists on the intervening night of April 4 and 5, was found on the outskirts of Hajin early today,” a police spokesperson told Hindustan Times. The suspected LeT militant Mohd Saleem Parrey and his Pakistani counterparts are the current suspects in the killing of Bhat. The militants had abducted both Bhat and his father Abdul Gaffar. However, Gaffar managed to escape. He is now hospitalised with bullet injuries. The reason for the beheading is not known.